The fruit that keeps on giving . . . | A balanced diet . . . So my Facebook friend, and IRRI’s coffee-shop entrepreneur Christine Jimenez (CJ to all her friends) told me, after I posted a story a couple of days ago from The Guardian website about the forthcoming sale in the UK of durians. Sounds almost philanthropic. Reportedly one of the smelliest foodstuffs around, durian is definitely an acquired taste – that’s if it can be acquired at all. As another Filipino friend and former staff member of mine, Tom Clemeno, also commented: It’s the fruit that smells like hell but tastes like heaven. I have tried durian on just one occasion, and that was once too often. You definitely have to get past the smell in order to savor the fruit. I found the fruit extremely rich and ‘custardy’, that left me with a lingering aftertaste for a couple of days and, unfortunately, ferocious heartburn. So what’s all the fuss about? Durian (Durio zibethinus), one of about 30 or so species, several edible, is quite a large fruit weighing up to several kilos. And although it is prized as a fruit delicacy in Southeast Asia (where it’s a native species) it is also one that is banned in many public venues. Just take a look at all the images here of public signs. There was a piece about it on the BBC One Show last night, and it was only at the very end of the program that a raw fruit was unwrapped – even though they had tasted durian products like ice-cream earlier on. One of the presenters, Matt Baker, became visibly distressed and almost threw up! A former colleagues, fish expert Roger Pullin, was traveling on Singapore Airlines one time, and as the passengers were settling into their seats the purser announced that there was a durian on board and asked the owner to approach one of the cabin crew. Nothing happened. 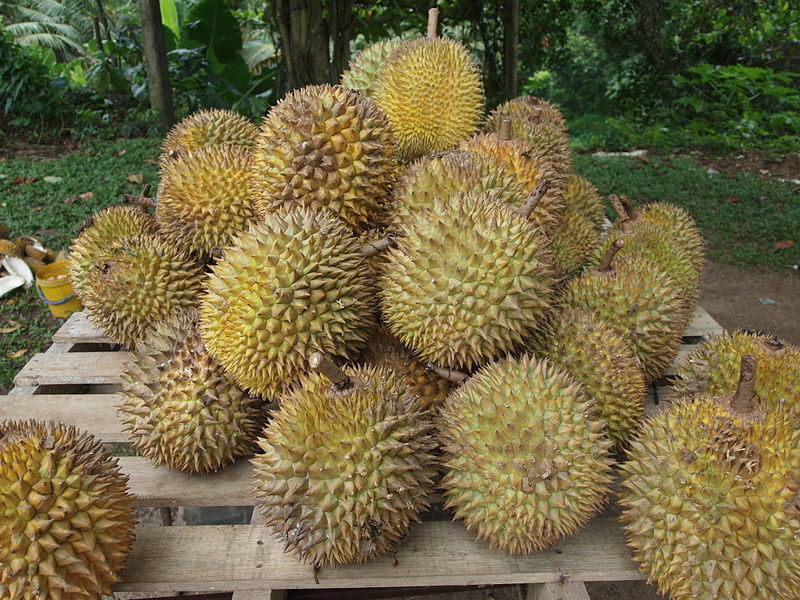 The announcement was made a second time, and on the third occasion, the Captain announced that he would cancel the flight unless the owner of the durian was identified and the fruit removed. 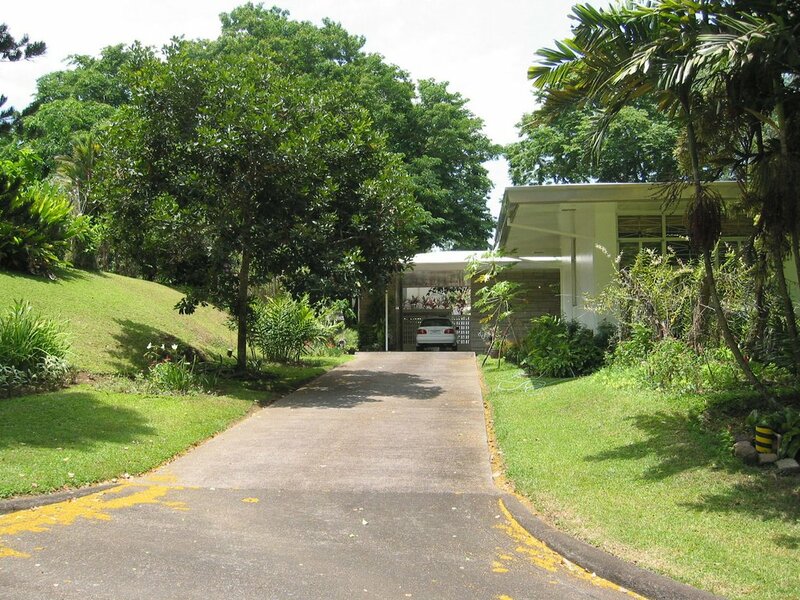 Sheepishly, Roger mentioned that he had a durian in his suitcase, in the hold. But this durian was in the cabin, and the odor was being distributed through the aircon system. Eventually a fruit was discovered in one of the overhead compartments, and unceremoniously thrown off the aircraft. It’s that sensitive an issue. Why subject yourself to the unpleasantness of the durian when there are so many other wonderful tropical fruits to enjoy? Having lived in Peru, Costa Rica and the Philippines for almost 30 years in total, and having traveled throughout the Americas, Africa and Asia, I grew fond of several in particular. In the UK we have ready access to bananas, mainly from the Americas, the long, perfectly-formed Cavendish varieties. In the Philippines there is a wealth of diversity of delicious bananas: big ones, little ones, starchy or sweet, and some that have an exquisite apple-like flavor. Then there’s the rambutan (Nephelium lappaceum) – arguably my favorite. The fruit is covered in soft spines, and this ‘shell’ is easily removed to reveal a fleshy covered seed inside. Sweet and juicy, they are hard to resist. One of my former staff, Amy Juliano, had several wonderful trees in her garden, and each September when they were in fruit, she would arrive in my office with several bags (kilos) of ripe fruit. Steph and I decided to plant some of the seeds. We should have done a little more botanical investigation beforehand. Although in just a few years the seed grew into quite a large tree, we had planted the seed of a male tree – not a single fruit! The Philippines does not have a large citrus industry like many other neighbor countries because of virus epidemics in the past. There are no oranges, limes or lemons to be had locally, but instead a native fruit not known in the wild, the calamansi (a hybrid species, × Citrofortunella microcarpa) – which, although small, does produce lots of juice – is great substitute for lime in a gin & tonic, or sprinkled over a sweet portion of papaya. One of its common names is ‘Philippine lime’. Another wonderful citrus fruit, imported into the Philippines as far as I’m aware, is the pomelo (Citrus maxima), rather like an overgrown grapefruit. The individual segments separate very easily. We found it just a couple of weeks ago on sale in our local supermarket, imported from China. In Costa Rica one of the favorite fruits – but not mine – is the water apple (Syzygium samarangense, syn. Eugenia javanica). Once or twice a year the tree in our garden on the CATIE campus in Turrialba was covered in fruit, and lots of employees from the center would stop by to gather sacks of the fruit. I never did enjoy them. In the Philippines we were fortunate to be able to buy a complete range of local and imported tropical and temperate fruits (like apples for example – still one of my favorites). The Fuji apples (imported from China) are certainly big enough to share between two. And that continues in the UK. So with all these wonderful fruits available I’m certainly not going to offend my taste buds by sampling again such a potent one as the durian. It won’t be on my shopping list any time soon even if it does arrive on the shelves of our local store. This entry was posted in Musings from the past, On my mind . . . and tagged durian, tropical fruits.